Coastal lines display the shoreline position in coastal areas. 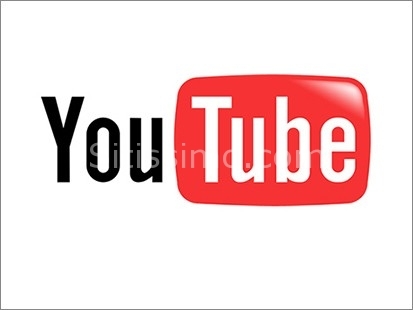 They are of fundamental importance in several applications. 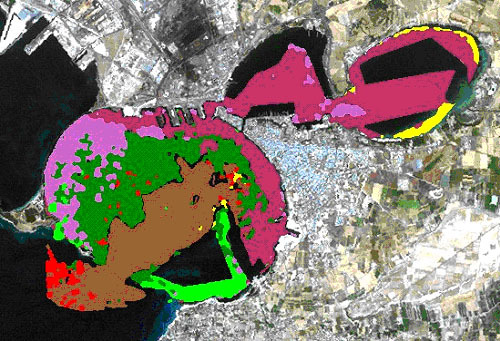 Moreover, the coastline could be seen as a relevant parameter for the monitoring of the coastal zone morphology, as it helps in the retrieval of precise digital elevation model of the entire coastal area. 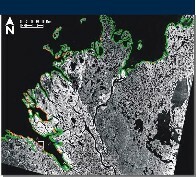 Using SAR and optical images with data fusion, classification and filtering techniques, it is possible to extract in a semi automatic way the shoreline from remote sensing data, with a precision depending on the spatial resolution of the image. Initiatives for coastal zone management can benefit from historical information on the dynamics of the coastline. Existing archives of satellite remote sensing data are a valuable resource for this type of information. "Water quality is the physical, chemical and biological characteristics of water. It is most frequently used by reference to a set of standards against which compliance can be assessed." - Wikipedia. Ocean Color (OC) analysis refers to a method of indicating the "health" of the seawater, by measuring oceanic biological activity by optical means. Standard Ocean Color products are well calibrated over ocean waters. 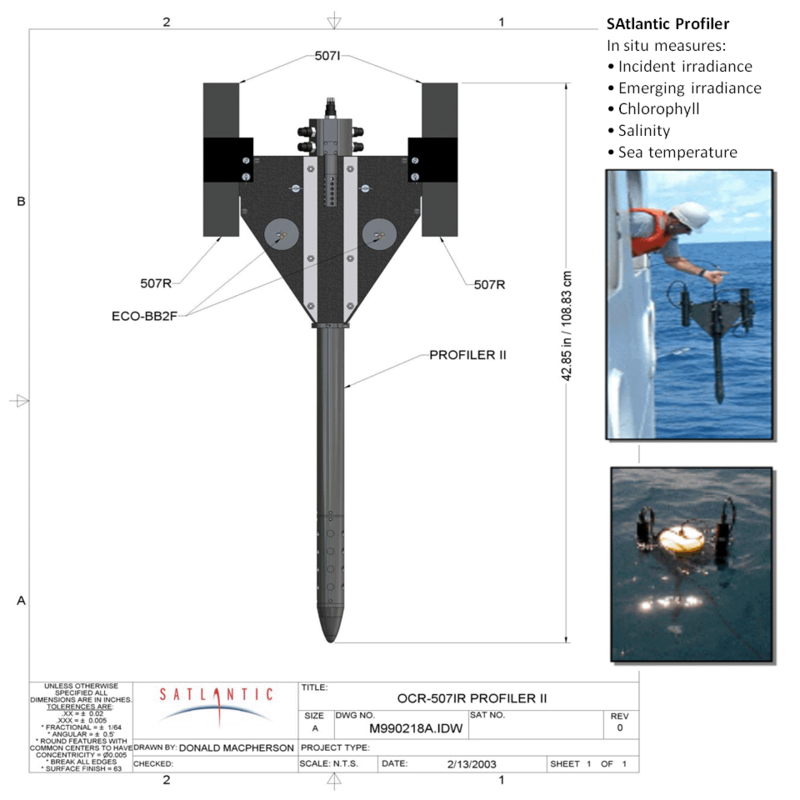 Shallow waters require a very sophisticated processing considering local features of the target area. Marine benthic communities is generally considered to be an essential activity to increase understanding and hence the correct management of coastal areas. Posidonia Oceanica is a marine phanerogam characterizing an ultimate succession stage (climax) on sandy bottoms in the Mediterranean Sea. Posidonia Oceanica meadows provide the most important and productive ecosystem in the Mediterranean Basin, playing a wide variety of roles in the ecological balance of coastal waters. In particular, Posidonia Oceanica ecosystems contribute significantly to water oxygenation through photosynthetic activity, give shelter for many marine animals, produce a large quantity of biomass towards neighbouring ecosystems, stabilize sandy shores and sea beds by dampening wave action and subsequent sediment accumulation, mould the coastline and protects sandy beaches from erosion. The figure shows how GAP can provide maps with a classification of seagrass communities. 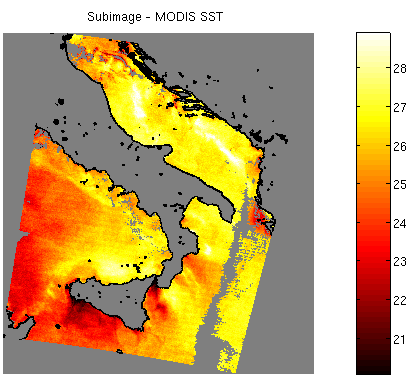 More specifically the figure shows the results of this classification applied on a Landsat TM, on Taranto Seas, with an Overall Accuracy of 70%. Dark Green areas identify Posidonia meadows. Chlorophyll is the pigment that allows plants, including algae, to convert sunlight into organic compounds through photosynthesis. Measuring chlorophyll a concentrations in water is a surrogate for an actual measurement of algae biomass. Excessive amounts of chlorophyll a indicate the presence of blooms, which usually consist of a single species of algae - typically one that is not desirable for consumption by fish and other predators. Unconsumed algae sink to the bottom and decay, depleting deeper water of oxygen. Suspended minerals is a measure of the amount of sediment moving along in a stream. It is highly dependent on the flow of water and usually increases during and immediately after rain events. As the sediment settles out of the water, aquatic habitats are often destroyed. Suspended matter plays an important role in water quality management since it is related to total primary production (e.g., nutrient release) and fluxes of heavy metals and micropollutants. The procedures implemented and tested are based on the processing of Satellite Images that allows to retrieve the Total Suspended Sediments Map. 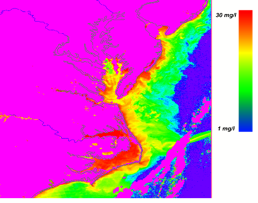 The figure shows the study of the dispersion of sediments after the Isabel Hurricane in Chesapeake Bay in US. The circled region highlights a narrow plume of sediments moving toward the ocean. Colored dissolved organic carbon, also referred to as fulvic acid and humic acid, contributes to the brownish tan color of a waterway. Tannins are one example of such compounds. In a nutrient-poor environment, it can serve as a nutrient allowing for the growth of algae whereas in a nutrient-rich environment, it can be given off as a byproduct from the decay of algae. Turbidity is a measure of the amount of particulate matter that is suspended in water. Water that has high turbidity appears cloudy or opaque. High turbidity can cause increased water temperatures because suspended particles absorb more heat and can also reduce the amount of light penetrating the water. Water temperature affects the ability of water to hold oxygen, the rate of photosynthesis by aquatic plants and the metabolic rates of aquatic organisms. Causes of temperature change include weather, removal of shading streambank vegetation, impoundments, discharge of cooling water, urban storm water, and groundwater inflows to the stream. 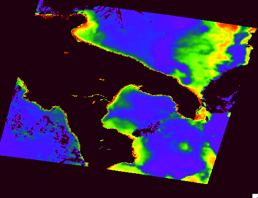 To calibrate coarse space data with local ground truth measurements of physical and biological parameters on coastal waters, dynamic modelling techniques have been used for proper interpolation. The figure shows the modelling of the winter temperature dynamics in the waters of Mar Piccolo and Mar Grande of Taranto. Temperature variation modeling in the Taranto "Mar Piccolo" and "Mar Grande"
Bio-physical parameters characterizing the quality of the sea water can be determined measuring the water leaving reflectance extracted from the optical and IR data of oceanic satellites, after removing absorption and diffusion effects due to atmospheric gases and aerosol. More difficult is the analysis of the coastal waters due to effect of bottom reflection in shallow waters and the presence of different types of aerosols. 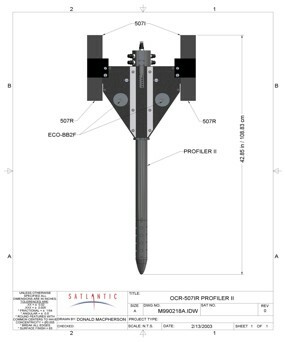 Sophisticated instruments are available in GAP to determine directly the values of biophysical parameters with measurements in situ for calibration and validation purpose. The AERONET network (Aerosol Robotic Network) is managed by the NASA Goddard Space Flight Center to provide measures that can be used for the validation of satellite observations for atmospheric and climatological studies and it's a part of a worldwide network for the measurement of aerosols in the atmosphere. The measures carried out every 15-30 minutes from the sun photometer to scan, are directly sent to the Goddard and analyze them in almost real time. 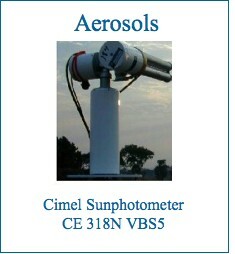 Stations provide direct measurement of aerosol optical thickness at different wavelengths and the size distribution of particles in the atmosphere. 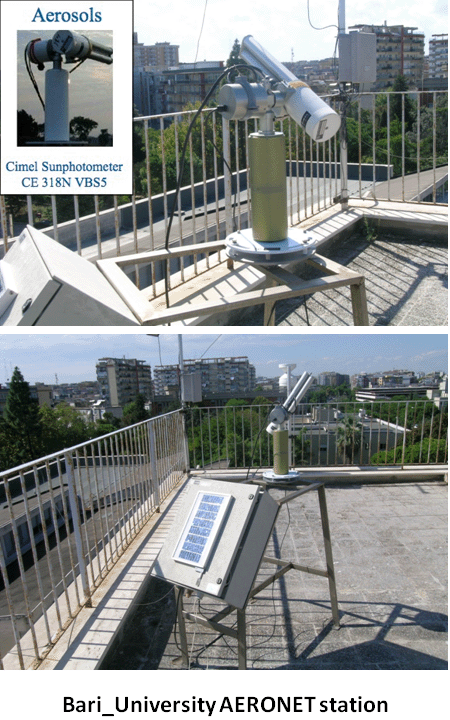 An AERONET station is located on the roof of the Physics Department of the University of Bari, named Bari_University. It is actually maintained by the Physics Department of the University of Bari in collaboration with GAP srl. A second one, named Bari_Waterfront, is installed on the roof of ARPA (Regional Agency for environmental protection) of Bari, near the waterfront.